Our maple almond-flavored English muffins are delightfully toasty treats that might remind you of a stack of pancakes drizzled with maple syrup. Created with our world famous recipe, our English muffins have an ideal crispy texture when toasted and wonderful air pockets to hold your favorite toppings. 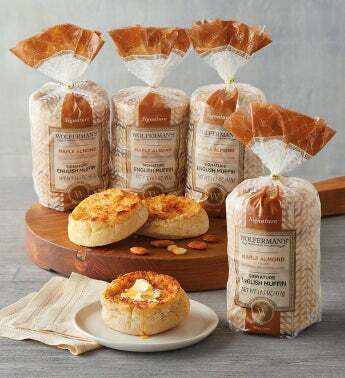 Our gourmet English muffins are freezer-friendly and kosher.